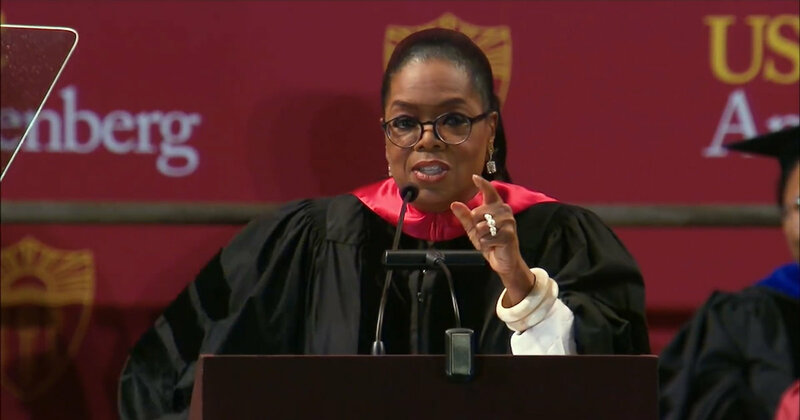 In the recent speech by Oprah Winfrey at the Graduating Ceremony at Annenberg School for Communication and Journalism, there was something really "Thriving" to be shared at Thrive! I was never been her fan, never heard her before, nor followed her on Twitter or LinkedIn, but when I watched her recent speech at Annenberg School for Communication and Journalism, the last week, I thrived to learn more about her. It is not a coincidence that, when I was preparing my final research papers, I was down, tired and demotivated! I wasn’t sure I’ll get the attention of my professors on my thesis. Though, I am not a professional thesis writer like most of the research students are! But thanks to this video I just watched before, and it felt like I’ve taken some energy drinks! I don’t go so far, just to talk about the cores what really inspired me from her speech and made me write about it. So I got these some of the most amazing lessons for life that urged me to shake my head, to think and to write. There Aren’t any Bad News! Yes, there aren’t! It’s bad until and unless you take it to be bad. And what about the good news? They are all around us and making us joyful just we need to identify them. Just as she said, “Many of your parents are probably taking you to somewhere really special for the dinner tonight”. That’s the good news! But not everyone noticed within that huge crowd. But this doesn’t mean nothing is bad out there, not everything is going fine. To stand against those, and to fight the dark, let’s see what she says. The solution is each and every one of you! Because you will be carrying up this load of responsibilities with you. The world is hoping, seeing a great spirit of Thrive in you! She says that you are the ones that keep those people in the shake! This moment of time is your time to RISE! The greatest lesson, and bitterly the hardest to implement, the truth! It’s of the best habits of successful leaders, not of this age, but of all the ages. Anyone around us advises to speak the truth, but the way she teaches is awesome! To Tell It! To Write It! To Proclaim It! To Speak It! But… to Be It! After all writing about this, I have the right to ask you! Thrived? Motivated? If still I am failed to give you the vision I just got, why don’t you watch the speech yourself! I am Muhammad Roohan (AKA Rohan Shah) a Geek in Digital marketing, SEO, SEM, Social media, Content Marketing, Growth Hacking, Coding, AI, and Big Data. I have designed growth hacking business models for Archideators, an Interior Design Company. Beside this, I write about Tech, Marketing & Business on The Ideators Blog.